Metropolitan Osaka is the second largest city in Japan and is considered the center of economy and culture. Rail lines eminate from the center of the city to surrounding areas. The Osaka monorail is being built to connect these outer communities with a half circle system which will eventually surround the city with over 50 km of track. The first 6.6 km segment opened in 1990 north of Osaka. The system now begins at the Osaka domestic airport, heads east along a freeway, then turns south with the freeway and crosses a dramatic arched bridge built exclusively for the monorail. A spur line has been added which connects the system to a university and a new community being built from scratch with the monorail corridor in mind. The Hitachi four-car trains draw 1500 volts direct current from the bus bars that run along the side of the guideways. 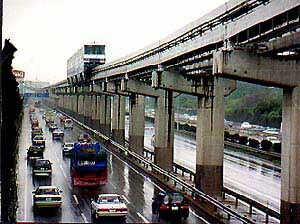 In 1995, the disastrous earthquake of nearby Kobe proved to be a test for the Osaka Monorail. It withstood the violent quake and proved to be a vital transit link in the area as traffic on the parallel freeway became completely jammed with evacuees.